By leaving your email address in the box, here above, you agree to receive information about our future publications and surveys. Coworking is not a ‘city only’ phenomenon. Since a while, singles, young couples and families are moving away from the noisy pace and high costs of metropoles to settle within remote areas, looking for wellbeing and affordable cost of the countryside. If Coworking in small towns and rural areas isn’t new, it keeps nowadays growing, as the last Coworking Europe conference’s editions confirmed. Therefore, it made sense to more specifically survey this segment of the coworking market in order to understand the coworking realities experienced outside main urban centers. Spaces from all over Europe and the world took part in the survey. Within the final sample, France, Germany, Austria and Spain are the most represented countries. Most of the surveyed spaces (62%) are located in towns with a population 50.000 to 150.000 inhabitants big. About 20% of the survey spaces are located in towns with less than 10.000 inhabitants and a 4% in the pure countryside. The respondents operate rather small coworking space in size, between 100 and 200 m2 on average. Only 17% operate surfaces larger than 501 m2. A majority of the spaces have been in operation for more than 3 years. One third of the spaces represented in the sample are 4 years old or more. The lack of awareness about the existence of the “Coworking” concept is mentioned as one of the biggest challenges coworking spaces struggle with in small town and rural areas. The positive flip side of the situation, is that they face few or no competition in their immediate surrounding. 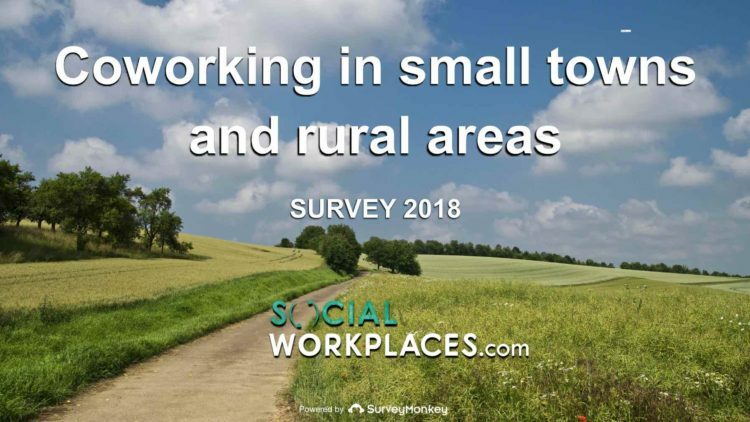 A big deal of the respondents in rural areas provides with traditional coworking services : meeting rooms, hot-desking in an open space, fixed desk in an open space and event venue. Mokrin House (Serbia) is an example of a very successful coworking project located in the countryside. Product such as ‘content production’, ‘private offices’, or ‘sponsorship’, are offered to a lower extend in rural area located coworking space. More than 80% of the surveyed spaces operate without any public subsidies. The biggest part of the surveyed coworking community members live within a range of 5 to 20 km from their space. According to the respondents, the first motivation of members to join the space is : “looking for a business minded work environment“. They “look for a place where they can discuss with other peers and find new opportunities” in second place. The third motivation is : “we like the atmosphere of the space“. The coworking communities are mainly composed out of freelancers, SME’s, employees and startups. The coworking space is barely used as a satellite office of corporate employees aiming to avoid to commute to their company’s HQ. The main takeaway from the survey is likely that coworking in small town and rural area still offers a big untapped potential. A big deal of the faced challenges are related to market education. The coworking market outside big cities still is in a fairly young stage of maturation. There is room for growth, as the average surface and the level of local competition appear pretty low. Moreover, so far, the opportunity for larger organizations to use small town located coworking spaces as satellite offices is widely unnoticed. Coworking spaces play a key role revitalizing small towns and rural areas bringing the talent back. A good example is The Ludgate Hub located on the Southern coast of Ireland, in one of the most rural and remote areas of the country. After two years, the main results of the Ludgate Hub include the formulation of a digital strategy for a rural town, the creation of new jobs for the area, introduction of new families into the area, a boost of expenditure in the building, and services.